US President Donald Trump's national security adviser said on Wednesday that the United States is not seeking to oust Iran's leadership but wants "massive change" in its behaviour. Wrapping up a visit to Israel, John Bolton also warned Syria's President Bashar al-Assad that the United States would respond "very strongly" if chemical weapons are used against the country's last major rebel bastion. The hawkish former UN ambassador who joined Trump's administration in April spoke at a press conference in Jerusalem at the end of a three-day visit that focused largely on Iran, Israel's main enemy. US and Israeli policy toward Iran has been closely aligned under Trump. "Regime change in Iran is not American policy, but what we want is massive change in the regime's behaviour," said Bolton, who before taking office advocated regime change in Iran. Echoing Israel's position, he said the nuclear deal had allowed Tehran to finance militant activity in the region due to the lifting of sanctions. Bolton said that "by bringing the hammer down again of reimposing American sanctions, we've seen a profound negative effect on Iran -- I think actually more serious than we would have predicted." European countries have sought to save the nuclear deal, saying it is working as intended by keeping Iran from obtaining nuclear weapons for now. Israeli Prime Minister Benjamin Netanyahu and Bolton have called on European countries to do more to pressure Iran. Bolton now heads to Geneva, where he will on Thursday meet his Russian counterpart Nikolai Patrushev on Syria, including Iran's presence there. He will also follow up on Trump's highly controversial July summit with Russian President Vladimir Putin in Helsinki. Netanyahu points to Iran's presence in neighbouring Syria as a severe threat to his country, and he has vowed to keep it from entrenching itself militarily there. Tehran is backing Assad's regime in Syria's civil war alongside Russia. Israel has pushed Russia to at a minimum keep Iranian forces and their allies, such as Lebanese Shiite group Hezbollah, far away from the ceasefire line in the Israeli-occupied Golan Heights. According to Bolton, Putin has told US officials that he also would like to see Iranian forces exit Syria since the two countries' interests there are not precisely in line, but "he said I can't do it myself." Bolton added that "the point was that perhaps joint US-Russian efforts might be sufficient." "Now I don't know that that's right either, but it's certainly one of the subjects that I'll be discussing with my Russian counterpart in Geneva tomorrow." A series of recent strikes in Syria that have killed Iranians has been attributed to Israel, though Netanyahu's government rarely confirms them publicly. 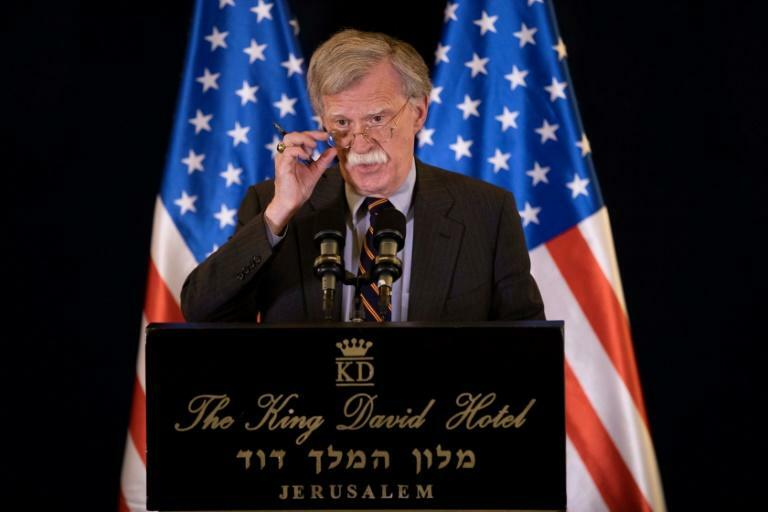 Bolton referred to those strikes, saying "every time Iran has brought missiles or other threatening weapons into Syria in recent months, Israel has struck those targets." "I think that's a legitimate act of self-defence on the part of Israel," Bolton said. Separately related to Syria, Bolton had a warning for Assad as speculation increases over a Russian-backed government assault on northern Idlib province, home to the last major rebel stronghold in the country. "Just so there's no confusion here, if the Syrian regime uses chemical weapons we will respond very strongly and they really ought to think about this a long time before they come to any decision," Bolton said. His comments followed a joint statement by the United States, France and Britain on Tuesday that issued a similar warning. In April, the United States, France and Britain launched joint missile strikes on Syrian targets in response to an alleged chemical weapons attack in the town of Douma that left scores dead. After seven years of war, Assad has set his sights on retaking control of Idlib, which borders Turkey. The regime holds the southeastern tip of the province that is home to some 2.5 million people -- more than half displaced by Syria's war or bused into Idlib under surrender deals. Bolton will visit Ukraine following his trip to Geneva.